I bought all of this for $20.12 I am amazed, myself, because this is a month's supply of milk for the family, 4 jars of natural peanut butter, soy milk for me, about a pound and a half of smoked almonds, hot dogs, cookie mixes and canned frosting. It was Senior Discount Day, so 10% was taken right off the top for any of the house brands, and natural foods. The milk was on sale, already for 99 cents each, plus the 10% discount on those. 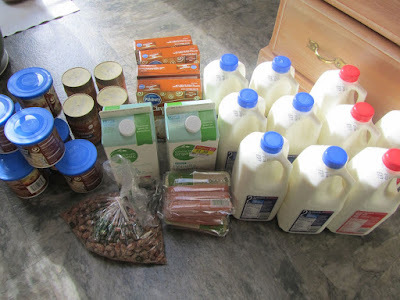 The soy milk was on markdown, plus 10% off, as it is one of Fred Meyer's house brands. The smoked almonds were on sale for $4.99/lb, and they also received the 10% off, as they come from the natural foods' section. As I was about to check out, I saw these cookie mixes and canned frosting on markdown, the cookie mixes for 42 cents/box, and the canned frosting for 37 cents/can. I could not pass those up. Even though I prefer scratch products for myself (digestive issues with packaged foods), these are perfect for when it is my turn to serve at coffee hour (which happened to be this past Sunday). If you are a math whiz, you have probably figured out that surely this must have cost more than $20. I also had a $10.83 reward to use before March, from the autumn reward's cycle. And that brought my grand total down to $20.12. Sadly, what was not in my cart that day was produce. I did pick up some fresh fruit and vegetables a week ago, Friday. Those items will have to do for the moment. Anyway, I was incredibly pleased to spend so little. well done, the price of the milk was great we can't get it that low here in Canada. That is what I hear about US dairy prices compared to Canadian. You do have a better deal with medical care costs, though. Have a great day, Gill! Lots for your money! Good job thinking ahead to a us for the cookie mixes and frostings. I know I'll be able to use them. I already baked one box of the cookies, and frosted them, for yesterday to take to church. I'll use the other mixes between now and next fall. The frosting, while it's flavored "cinnamon bun" will be our birthday cake frosting for the next several birthdays. It's also really delicious on cinnamon rolls. My daughter made a pan of those for yesterday morning, and used some of the frosting on those. That was a pretty impressive shopping trip. I too try to keep a mix or two on hand for those last minute things to take somewhere. Yeah, a little unbalanced, but we'll manage. I still have a lot of veggies, and canned, frozen and dried fruit. I haven't bought many mixes in the last 20 years, because of my own sensitive digestion. However, they are awfully handy to keep around. It makes needing to bake sound less daunting when I'm really busy. I love those shopping trips too, where I double or triple my savings by combining discounts. I missed a few extras on my Friday shopping to Target. I forgot to use a Groupon voucher at checkout (purchased $10 egift for $5), a $1 coupons.com printable was not accepted (very strange since it was a perfectly good coupon), and I lost out on $7.50 Checkout51 rebate on canned beans because the rebate disappeared when I got home to process the claim (I plan to return the 10 cans of beans on my next shopping trip). Despite the setback ($1 coupon), I did fairly well. Our grandsons are enjoying the Hormel pork loin with homegrown collard greens, bacon and strawberries from that shopping trip. I used Target cartwheel, printable coupons, and Ibotta and Savingstar rebates. I also had to go back to customer service after checkout to ask for a refund on an incorrectly rung item. Also got 5% Target Red card discount and .25 bag credit (5 × .05). I think the cashier felt badly about rejecting my coupon so gave two extra bag credits. I brought three reusable bags and she had to stuff everything in them. Also, I spent a few hours printing and researching and setting up the deal scenario, let alone the time spent to shop and correct errors, and process and track rebates. Sometimes I question my sanity but I think it is worth it to save several hundred dollars a month shopping this way. The downfall is I may be buying unnecessary items because of the extreme discount, but we like to give stuff away too, and what better reason than to say we got it at a good price. It always brings a smile. I just recalled, that I lost an additional $2 savings on canned soup because I didn't print the coupon as soon as it was available. I got only the $2 Savingstar rebate, but could have doubled my savings to $4 if I had not procrastinated. The soup is my father's favorite (Progresso beef pot roast), so I bought it anyway. That's a shame about some of your work in the couponing not paying off. Will your groupon deal still be good the next time you go? It is a lot of work, and that's why not everyone does it. However, the way I look at it is this. Doing coupon/deals is like your part time job. It doesn't pay terribly well, for the hours spent, but it is a job that you can do whenever it suits your schedule, you don't pay income taxes on your "earnings", you don't have to get dressed for work to do this job, you are your own boss, and you can quit, then rehire yourself, any time you want. And it keeps you busy doing something that feels like a game. If mainstream society valued this kind of work, more, then it would feel more palatable, I suspect. But then if more people couponed to the extent that you do, there would be fewer of the deals to go around. Have you ever tried growing strawberries? Did you have a fun weekend with your grandsons? The meals sound really yummy! Oh, I love the way you think. I hope it means "great minds think alike" lol I see "tweaking the deals" as part work, part game and part mental exercise. I know there will be a day in a few years when I won't want to be as frugal as I am today. But I hope my frugal habits will be so entrenched that I won't need to think as hard to continue the savings. That's my reason for spending the time now. I know I must seem pitifully ridiculous at the checkout being such a careful shoppper in my old age. Most people my age should be in their golden years spending their wealth as they please. But I get over the uncomfortable feelings and just stick to my plan of working the numbers because numbers don't lie. I watch my bottomlines very closely. I keep worksheets that list every frugal saving over and beyond sales and coupons, that require the extra step to save a bit more, almost 5K every year. I also keep tract of bottomline net expenses, fixed and discretionary, after rebates and credits, ever year. I also keep track of net worth, these all should mirror the same trend. The story for us is frugality and tweaking store deals allow us to live well for so little spending. I know our bottomline would be at least 24K more per year without this effort. Not small change over time. That's the crux....over time. So when standing at the checkout looking a bit ridiculous, I know OVER TIME it all makes sense. The Groupon voucher is redeemed, so it has no expiration. I guess my only missed savings was those printable coupons. The cans of beans are also going to be returned. At .24-.50 per can, I am interested in can beans, not .99-1.25 per can. We haven't tried growing strawberries. Would it grow in hot, dry climates? So far collard, swiss chard and kale are easy to grow in our climate. Our grandkids are still here, going home this evening, since today was Teacher Institute day (meetings). The strawberries from Target were so sweet and delicious. I made chocolate dipped strawberries with clearance melts from Sams Club. They were a hit. Good to have peanuts in the pantry because I was able to coat peanuts when it wasn't easy to dip more strawberries. I should add shredded sweetened coconut flakes next time, then it would be like Mounds? Great shopping trip, Lili! I don't think I've ever seen milk priced that low here, so nice that you were able to take advantage of that! Also, congratulations to your son on his engagement. That is very exciting! I'll pass the congratulations on! I'm very happy for both of them! I was very pleased with the shopping. 99 cents/half-gallon is Fred Meyer's standard sale price, so it didn't seem overly inexpensive to me. But judging from comments, maybe our milk prices are quite low in the Seattle area. I hope your day is off to a lovely start, Laura! Great deals! It is so fun to get things at a great price. If you ever need any thing from Ross Tue they give 10 percent off to seniors and I think the age is 50. Hi Patti,Thanks for that info, Patti! I'll be sure to add Tuesday at Ross as my go-to time/day. Good job on the deals! Last week we had an interesting shopping moment. We needed after shave for hubby and something else that I can't remember. At the checkout our total was something like $6.67. This store shoots out coupons out of a little coupon machine and there was one sticking out of the machine that said $5 off your next shopping so we pulled it out and used it. My guess is that it came from someone previous to us and he/she didn't take it so there it was for us to use. Our bill was now $1.67. People leave their coupons on top of the register so I'm guessing anyone can pick them up to use if they want to. Some of the ones I get aren't very useful when they say "get $2 off fresh produce when you buy $75 in produce" What? That's not a deal! We're still eating much out of the freezer and even with unexpected guests yesterday (not my own kids though!) I pulled out some pork from the freezer and cooked them in my pressure cooker. Along with scalloped potatoes and green beans and applesauce (from the freezer and pantry) we had a delicious dinner. We have a "free" table at work and I took a packet of sugar cookies home. The date was expired but I made them anyway and we have been nibbling on sugar cookies all week with a frosting that I made and some red/white sprinkles and we had enough for our guests yesterday. Really good! Today there is a box of bran cereal on the table. Not sure if I want those but maybe they could be made into bran muffins. Alice, I'm guessing your "$2 off fresh produce ... " coupon was from Meijer--and I leave those by the register, too, as it's highly unlikely (unless I was throwing a party) that I would buy the quantities needed to achieve the sale price. I've been getting milk for $1.79 per gallon on a regular basis from Aldi for months and sometimes they even have it for sale for $1.49 a gallon. Meijer has also been selling gallons of milk for $1.79, so I guess we are fortunate to have such good dairy prices. I bought 3 dozen eggs from Aldi today for 69 cents/dozen--eggs were almost double that at Meijer. Lili, I am right there with you on the cookie mixes. Sometimes you just need something fast and easy. My standard is a bar cookie made from a yellow cake mix. It's a little sad to me that the middle school students at youth group prefer this over from-scratch cookies--so many of the kids only are familiar with packaged treats--but I suppose it makes it easier for me. Bake at 350* in a 13x9 pan for 28-32 minutes (I like mine slightly soft in the center). Cut into bars and serve. I get 24-28 out of this but in a pinch, I can get 48 small cookies out of this if I cut it into 24 squares and then cut those squares into triangles. It's an old Taste of Home recipe (giving credit where credit is due) and it has saved me on several occasions when I have needed a treat, fast. You can try other cake mixes--I tried a chocolate cake mix once and it tasted like the worst brownie I've ever had, so that was a no-go. Such a deal with that $5 off coupon! While I've never seen $2 off of a $75 purchase coupon, I have seen some ridiculous ones, especially around Thanksgiving. The past couple of years some of the stores have advertised "spend $100, get a free turkey". I don't ever spend $100 in one store, so that offer doesn't appeal to me. The Free Table where you work sounds wonderful. Is this something that your employers do, or is this something other co-workers do? In any case, what a great way to prevent food waste. years ago, my sister in law sent me a cookbook for improvising with cake mixes. I think making bar cookies was one of the suggestions. I'll have to dig that cookbook out and see what else is in there. Good to know about the chocolate cake not making very tasty brownies. I am picky about brownies actually tasting like chocolate. I agree. Sometimes box mixes are where it's at. Sometimes, a boxed mix means the difference between making something or not making anything. It's more a mental thing for me, as many scratch cookie or cake recipes aren't that involved. But if I'm pressed for time, the thought of getting all of the ingredients out and measuring every last thing sounds like too much. In addition to making the cookie mix last week, I also baked some sugar cookies, from pre-mixed and rolled out dough that I bought on markdown in January. Those turned out to be the easiest sugar cookies that I've ever made. The dough comes in sheets, all rolled thin. All I had to do was cut the cookies out and bake. I used that kind of dough because I bought it on discount and it was terribly cheap (55cents/package). It would be hard for me to spend a couple of dollars for the same convenience. However, the time-savings on that item was better than a boxed mix. I am guessing that your items were yummy, even though they were from mixes. All it seems to take is adding a little extra something to the mixes to really make them special.